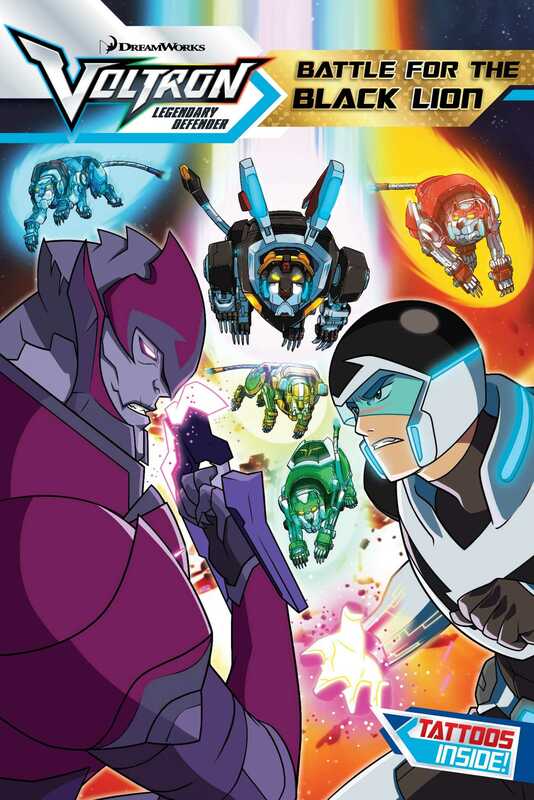 Ancient secrets are revealed when the forces of good and evil face off in this collectable chapter book retelling of the season one finale of Netflix’s hottest new series from DreamWorks Animation, Voltron Legendary Defender. Lance, Hunk, Pidge, Keith, and Shiro have trained hard to master their Paladin skills, and with the power of true teamwork, have unlocked the ability to form Voltron, the universe’s most powerful defender. Now with their Altean allies, Princess Allura and Coran, the Paladins embark on their most dangerous mission yet: infiltrate the Galra Empire and collect information to rescue Pidge’s family. But the Galra Emperor, Zarkon, holds a 10,000-year-old secret that rips the Black Lion from the Paladins. Unable to form Voltron and trapped inside a particle barrier, the Paladins are forced to battle the Galra Army, not only for the Black Lion, but for the galaxy’s last hope. Young readers will love this action-packed retelling complete with color episode stills throughout! This paperback edition comes with a sheet of tattoos. “Thanks to Pidge’s modifications, we’ll have thirty seconds of cloaking,” Shiro said as the Green Lion disappeared into the background of stars. The five Paladins of Voltron and Princess Allura gathered their courage as they flew from the Castle of Lions to a secret transportation hub of the Galra Empire. They landed on a craggy moon covered with machinery and snuck on to the base undetected. When they reached the central control room, the Paladins drew their Bayards. Hunk and Lance’s Bayards transformed into energy blasters. Hunk kicked down the door, and with two easy shots, he and Lance took out the robotic henchmen. The rest of the team streamed into the room. Shiro, the Black Paladin, didn’t have a Bayard. He knocked out the Galra lieutenant with his energy hand. Princess Allura restrained the lieutenant with energy cuffs. Keith covered the door with his Red Bayard, which had transformed into a sword. The room was clear. Pidge’s katar transformed back into her Green Bayard. She quickly unpacked the tech she’d made for the mission. “We only have a few minutes before the next patrol comes by,” Shiro told the team. He had been a Galra prisoner and remembered the sentry patrol pattern. “But that should be enough to get what we need,” he continued. Pidge connected her device to the control room computer, then to Shiro’s robotic arm. The Galra had transformed his arm while he was their prisoner. It was a constant reminder of the Galra’s cruelty, but it also allowed the team to interface with Galra tech. “I’ve made some software modifications since the last time we tried to download Galra info,” Pidge said. Now was the moment of truth. The team took a big risk sneaking onto a Galra base. They needed information if they were ever going to stop Emperor Zarkon from conquering the universe. Pidge’s device kicked into action, and the information downloaded at a rapid speed. “I say we challenge Zarkon to a fight—winner gets the universe,” Lance said playfully, tossing punches into the air. The other Paladins rolled their eyes. The Paladins knew Shiro was right. Since first forming Voltron, they had battled Zarkon’s commanders. They had barely survived, even with Princess Allura backing them up from the Castle of Lions. “We just need some troop locations, then we can start to free planets from the Galra Empire one by one,” Shiro explained. The information finished downloading. “What does it say?” Keith asked. Pidge frowned, and said, “Nothing useful. Just a schedule of the ships coming in and out.” The mission had been a bust. It was time to head back to the castle. Suddenly Princess Allura’s eyes widened. “Hold on, Pidge! Do you know where that ship is headed?” she asked, pointing outside. “It’s scheduled to be here for a half hour and then head off to Galra Central Command,” Pidge replied. That’s when Princess Allura’s adviser, Coran, chimed in over the communication device. “Oh, I’d rather you didn’t, Princess,” he said from the Castle of Lions. It was in Castleship mode and hidden behind a planet nearby. As one of two surviving Alteans, he knew only a member of the Altean royal family could pilot the Castleship through wormholes. Sneaking onto the Galra base with the team was one thing. Boarding an enemy ship bound for Central Command was another. If anything happened to Princess Allura, the Castle of Lions would be a sitting duck and the team would have no escape. “How are you going to get in?” Keith asked. “I’m going to walk right through the front entrance,” Princess Allura announced. She closed her eyes, concentrated her energy, and suddenly, her skin turned purple. She grew taller, and she looked Galra! “How the heck did you do that?” asked Hunk. “The Alteans have the ability to blend in with local people. It has made us great explorers and diplomats throughout our history,” she replied calmly. To complete the transformation, she borrowed armor from the lieutenant they had restrained with energy cuffs.